Imagining a hacker in 1903 generates at first sight too many contradictions: Were plastic frame glasses or black hoods fashionable back then? And what’s more important, computing didn’t even exist at that time. So, what could be hacked by the first hacker of all times? To understand the story of Nevil Maskelyne we have to go back to the end of the 19th century, with the discovery of electromagnetic waves: the wireless telegraph would be developed based on this finding and Guglielmo Marconi would be in the right place to become the commercial bastion of one of the century’s inventions. 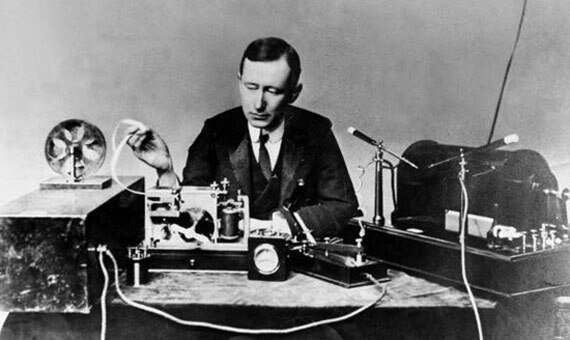 Although many scientists researched the nature of these waves and their possible applications, it was Guglielmo Marconi (1874-1937) who used them to transmit what is now considered the first wireless telegraphic message in history. In 1885, he used electromagnetic waves to represent the dashes and dots of the Morse code and managed to send signals at several kilometers of distance: wireless telegraphy was born. The winner of the Nobel Prize for Physics in 1909 for “his contribution to the development of the wireless telegraph” also proved his skills as a businessman, becoming a well-known and influential figure that was even given several titles of nobility. Marconi boasted publicly that the messages sent via his wireless telegraph were totally safe and could be transmitted privately, as he did in an article in the newspaper London’s St James Gazette in February 1903. 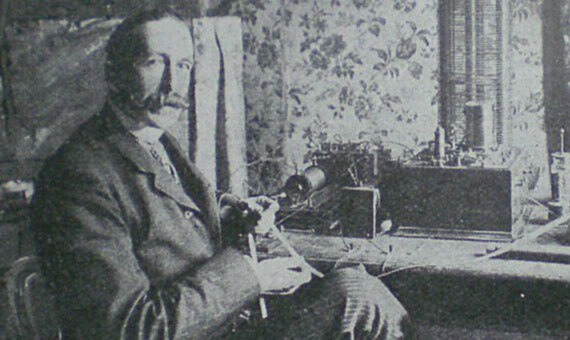 Marconi’s promise to deliver “confidential channels”, since the messages were sent on a given frequency, would soon be compromised by Maskelyne’s final trick. Was Maskelyne acting only out of personal revenge, or were there economic interests behind the damage to Marconi’s invention? According to the Royal Institution’s version, it was Eastern Telegraph Company that commissioned Maskelyne to prove Marconi’s invention wrong, well aware of the magician’s enthusiasm for wireless technology and taking into account also the large investment the company had made by laying kilometers of cable to develop the previous telegraphic system. Before the final show, Maskelyne developed the technology needed to intercept the signal: it wasn’t so complicated. With a rudimentary 50-meter radio antenna he managed to intercept the message that Marconi’s company was then sending to different ships at sea, without raising suspicion. Marconi had already shown that his invention worked, since in 1901 he had sent the first wireless signals across the Atlantic and was granted the famous (and controversial) patent 7777 for the wireless telegraph. 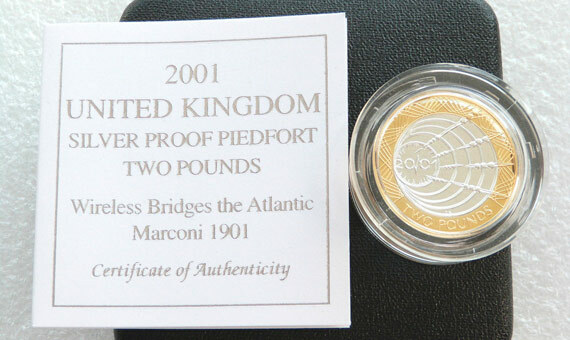 Only 2 years later, on June 1, 1903 Marconi’s experiment was demonstrated to the public at the Royal Institution in London, where the physicist John Ambroise Fleming received a message in Morse code that the Italian, who was then 28 years old, would send from Poldhu (Cornwall) over a distance of around 300 miles. To the inexperienced ear, there were no indications that things were going wrong, but to Fleming and his assistant, the rhythmic tinkling they heard before the exhibition was proof of the disaster. “Rats”. This was the word that “by magic” interfered repeatedly in the system prepared for the occasion. And the mockery continued, since several humorous verses discrediting Marconi and his invention were sent. This is human nature: the first hacking in history was to send an insult in Morse code. Like a technology serial, accusations were exchanged through the Times. In a letter to the newspaper, Fleming coined the expression scientific vandalism! to describe what had happened. He also asked the readers for help to unmask the author of such despicable scientific insolence. It wasn’t necessary, as Maskelyne was proud of his feat, and replied through a letter to the same newspaper, claiming that his intention had been to unmask Marconi and reveal the vulnerability of “his invention”. According to the magician, it had been for the common good.